A bighorn sheep standing watch atop painted cliffs, sunlight and shadow playing atop the salt and soda floor, a blue-gray cascade of gravel pouring down a gorge to a land below the level of the sea—these are a few of the many awesome scenes I’ll always remember and why I like to hike Death Valley National Park. Hike Death Valley National Park? The Forty-niners, whose suffering gave the valley its name, would have howled at the notion. “Death Valley National Park” seems a contradiction in terms, an oxymoron of the great outdoors. Enjoy a hike around the rim of Ubehebe Crater in Death Valley National Park. Park? Other four-letter words are more often associated with Death Valley: gold, mine, heat, lost, dead. And the four-letter words shouted by teamsters who drove the 20-mule team borax wagons across the valley floor need not be repeated. 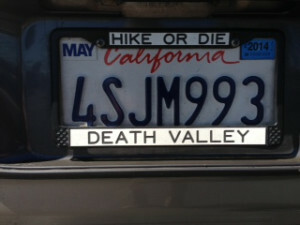 “Hike or Die, Death Valley” license plate frame–hopefully just for fun. 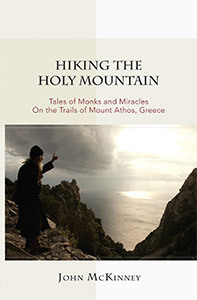 Hike? Well, “hike” is a four-letter word not commonly associated with Death Valley. However, we who like to hike Death Valley intend to subvert the dominant paradigm and share the park’s many intriguing trails. In fact, “Death Valley” got its name from some hikers—all be it some very unhappy ones. 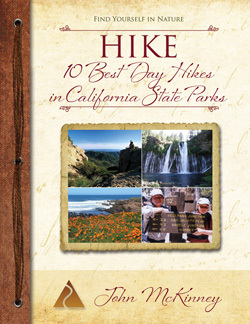 Looking for a shortcut to the California gold country, two groups of travelers with about 100 wagons got lost in the huge valley for weeks in December of 1849. After slaughtering their oxen and burning the wood of their wagons to cook the meat, they finally located a pass and hiked out of the valley. One of the women in the group is reported to have said, “Goodbye Death Valley!” and the name stuck. Even the hiker with little or no interest in geology can be awestruck by Death Valley, where the forces of the earth are exposed to view with dramatic clarity: a sudden fault and a sink became a lake. The water evaporated, leaving behind borax and above all, fantastic scenery. Although Death Valley is called a valley, in actuality it is not. Valleys are carved by rivers. Death Valley is what geologists call a graben. Here a block of the earth’s crust has dropped down along fault lines in relation to its mountain walls. Nope. Just doesn’t have the right ring to it. Many of Death Valley’s topographical features are associated with hellish images—Funeral Mountains, Furnace Creek, Dante’s View, Coffin Peak and Devil’s Golf Course—but the national park can be a place of great serenity for the hiker. 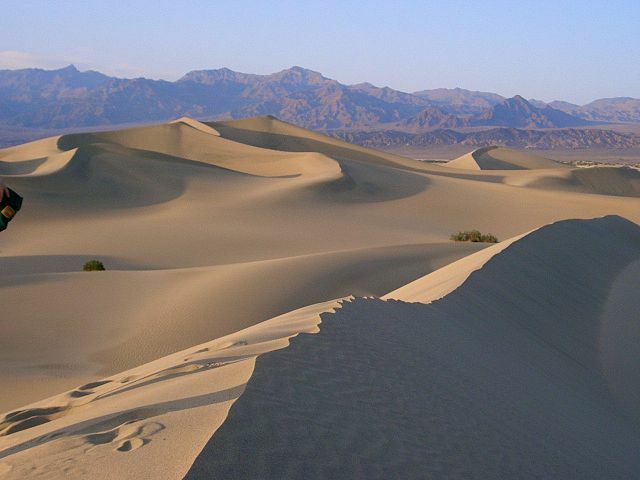 At 3.3 million acres, Death Valley is the largest national park outside of Alaska. The very notion of hiking the desert in general, and at a place like Death Valley in particular, is a surprising one to some people—even to some avid hikers. The desert that seems so huge when viewed from a car can seem even more intimidating on foot. Compared to forest or mountain parks, Death Valley has a limited number of signed footpaths; nevertheless, hiking opportunities abound because roads (closed to vehicles), washes, and narrow canyons serve as excellent footpath substitutes. The distances across Death Valley are enormous. If you only have one day, stick around the Furnace Creek Visitor Center. Take in Harmony Borax Works, Badwater, Dante’s View and hike the interpretive trail through Golden Canyon. For the average hiker, there’s a week or two’s worth of hiking in the park, though you can get a fair sampling of this desert in three to four days. Although it’s tempting, don’t over-schedule. 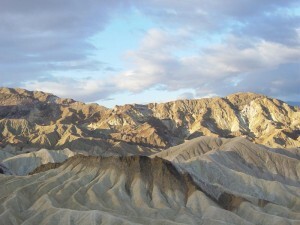 Death Valley is vast, with abundant sights to see and hikes to take. To see as much of the park as possible, choose a different entrance and exit highway. Several routes lead into the park, all of which involve crossing one of the steep mountain ranges that isolate Death Valley from, well, everything. If you enter on Highway 127 through Death Valley Junction, exit on the scenic byway through the Panamint Valley. If you entered from the Panamint side, take your leave of the park by following Badwater Road (Highway 178) south from Furnace Creek, across the Black Mountains and Greenwater Valley to intersect Highway 127 at Shoshone. A particular highlight of hiking Death Valley is encountering the multitude of living things that have miraculously adapted to living in this land of little water, extreme heat and high winds. Two hundred species of birds are found in Death Valley. The brown whip-like stems of the creosote bush help shelter the movements of the kangaroo rat, desert tortoise and antelope ground squirrel. Night covers the movements of the bobcat, fox and coyote. Small bands of bighorn sheep roam remote slopes and peaks. Three species of desert pupfish, survivors from the Ice Age, are found in the valley’s saline creeks and pools. In spring, even this most forbidding of deserts breaks into bloom. The deep blue pea-shaped flowers of the indigo bush brighten Daylight Pass. Lupine, paintbrush and Panamint daisies grow on the lower slopes of the Panamint Mountains while Mojave wildrose and mariposa lily dot the higher slopes. 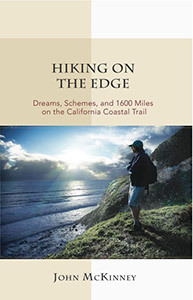 Hike smart, reconnect with nature and have a wonderful time on the trail.